Letter from John Muir to [William] Colby, 1910 May 20. Los Angeles, cal., May 20. 1910.Dear Mr. Colby:-I thank you for your long letter of May 16th. 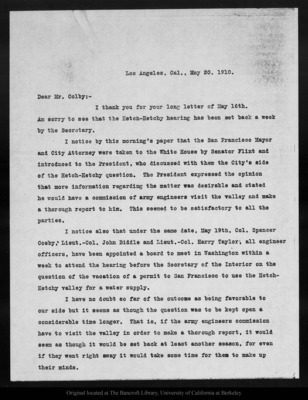 Am sorry to see that the Hetch-Hetchy hearing has been set back a week by the Secretary.I notice by this morning's paper that the San Francisco Mayor and City Attorney were taken to the White House by Senator Flint and introduced to the President, who discussed with them the City's side of the Hetch-Hetchy question. The President expressed the opinion that more information regarding the matter was desirable and stated he would have a commission of army engineers visit the valley and make a thorough report to him. This seemed to be satisfactory to all the parties.I notice also that under the same date, May 19th, Col. Spencer Cosby, Lieut.-Col. John Biddle and Lieut.-Col. Harry Taylor, all engineer officers, have been appointed a board to meet in Washington within a week to attend the hearing before the Secretary of the Interior on the question of the vacation of a permit to San Francisco to use the Hetch-Hetchy valley for a water supply.I have no doubt so far of the outcome as being favorable to our side but it seems as though the question was to be kept open a considerable time longer. That is, if the army engineers commission have to visit the valley in order to make a thorough report, it would seem as though it would be set back at least another season, for even if they went right away it would take some time for them to make up their minds. The Bancroft Library, University of California at Berkeley. Please contact this institution directly to obtain copies of the images or permission to publish or use them beyond educational purposes.